Born sighted, 'Blind' Dave Heeley showed athletic promise from an early age, smashing his town's 1500-metre track record aged just 11 years old. However, a devastating diagnosis shattered his sporting dreams and he hastily gave up on sporting activity. 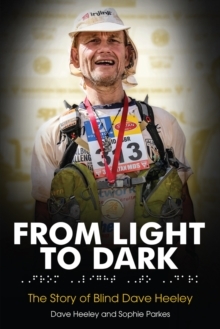 From Light To Dark charts Dave's story and how he rediscovered his boyhood talent for running and went on to undertake some of the world's toughest challenges, including John O'Groats to Land's End (with a difference); ten marathons in ten days; 700 miles of cycling across seven countries in seven days; and the 2015 Marathon des Sables, dubbed the 'toughest footrace on Earth'. In 2008 came Dave's greatest achievement, his name entering the record books as he became the first, and to date the only, blind person to have completed the ultimate endurance challenge of seven marathons, in seven consecutive days, on seven different continents.